Today I'm drinking Hades Belgian-Style Ale brewed by Great Divide Brewing Company in Denver, Colorado. Somewhere online, I saw the brewery recently asking for label redesign ideas, but I don't have time to go find that, probably on Twitter. Never mind, I found it from March 29. Go tell them if you have ideas. 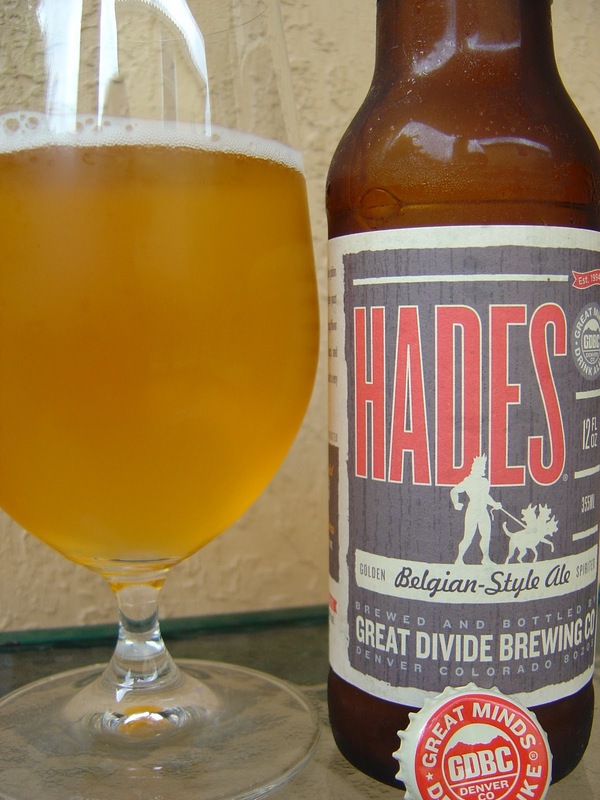 greatdividebrew Great Divide Brewing: got a #nontraditionalbeerlabel idea for one of our beers? we want to hear it! show us what you've got! I'm guessing that request is probably in connection with their very boring and starting to be stale label theme. This one has a thumbnail of Hades with his trusty three-headed canine Cerberus on a brown background. The large beer name appears over that, very typical from these guys. 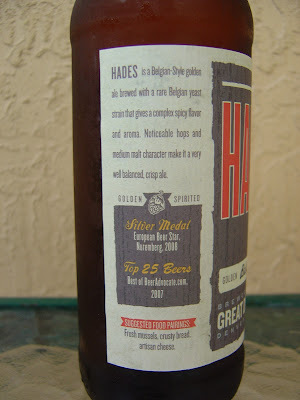 To the side, a simple beer description, their awards, and suggested food pairings. I never have any of that food in my house, ever. Who has fresh mussels or artisan cheese? I guess crusty bread could be that 3-day old Publix baguette, but come on. I do find it cool that this was named a "Top 25 Beer" by Beer Advocate in 2007. Bottled on Feb 03 2011. Fruity pear aroma with spicy and citrus hops beneath that. Light fruity peach flavor to start with just a touch of sweetness. Prominent banana as well. Spicy cloves and a hoppy bitter nip come next, balancing this right down the middle. The 7.8% alcohol warms throughout, also bringing out the fruity flavors. Belgian yeast is recognizable and contributes flavor and texture. Carbonation and body medium. Pretty plain but a good beer. Go ahead and give it a whirl.